AC Transit officials are proposing to cut weekend bus service nearly in half and make other reductions to improve the agency's bleak financial outlook. Agency officials will present their proposal at an AC Transit board of directors workshop Wednesday afternoon. The proposed changes are part of an effort to recover at least $15.7 million they say would have been saved if Amalgamated Transit Union Local 192, which represents 1,750 employees, including 1,200 bus drivers, had accepted a new benefits package and work rules. In addition to eliminating almost half of weekend service - lines on major corridors would be spared - the district's plan calls for cutting four of six overnight lines, outsourcing paratransit services for seniors and disabled people, and reducing the hours of operation on all of its lines. Although the proposed cutbacks will be presented Wednesday night, the board won't vote on them until Sept. 22. If approved, they would take effect early next year. Bus agency officials said a judge's recent ruling that AC Transit must return to what they believe are inefficient and expensive union work rules is costing them an additional $1.2 million a month. The agency already faces a $56 million budget deficit. Directors at AC Transit, which serves parts of Alameda and Contra Costa counties, voted June 30 to impose a new contract on its employees after three months of negotiations stalled. But on July 16, Alameda County Superior Court Judge Frank Roesch ordered the agency to engage in binding arbitration with ATU Local 192 to try to reach an agreement on a new contract. The district still imposed the new contract on July 18, but on Aug. 2 another judge, Judge Judith Ford, ruled that the district must honor the terms of the old contract during the arbitration process, which is expected to be lengthy. There was a large increase in absenteeism by bus drivers after management imposed the new contract, which included changed rules on scheduling and overtime. Management alleged that drivers were engaging in a sickout by ATU, but union officials denied that was the case and said instead that the absences were caused by poor planning and inadequate training on the part of management. AC Transit's board voted on Aug. 18 to appeal both court rulings. The agency is participating in binding arbitration and honoring the terms of the old contract while it waits for its appeals to be heard. 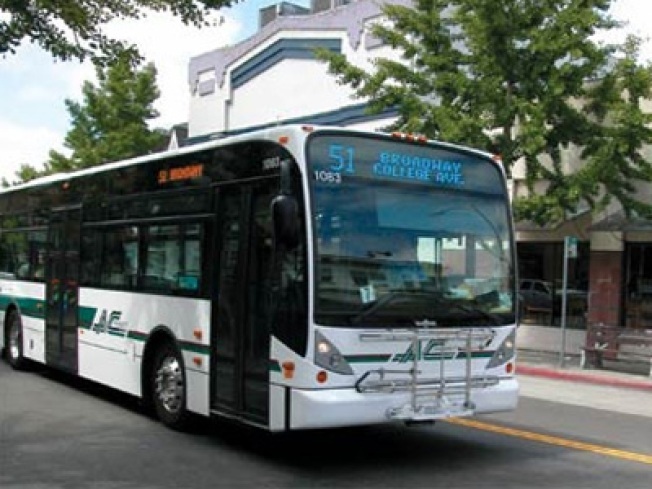 AC Transit Interim General Manager Mary King said the agency has already taken major steps to balance its budget, such as increasing fares, reducing service and eliminating general and administrative staff positions. "Because the ATU would not compromise in contract negotiations, they have severely impacted our ability to provide service to our customers, who are primarily working people, the young, seniors and the disabled," King said in a statement. She said, "We do not want to cut this amount of weekend service, but the union has given us no choice." Lead union negotiator Claudia Hudson said management's plan to make additional service cuts is "absurd" and described it as "executive vandalism." She alleged that, "They're trying to hold the public hostage." Asked how AC Transit could save money in its effort to balance its budget, Hudson said, "I have no idea." She said she was willing to negotiate with management on a new contract but that the union won't let AC Transit dictate the terms. "An economic situation doesn't preclude you from negotiating," Hudson said. She said the arbitration process has been moving slowly because management's lead negotiator has been on vacation. Hudson said there was a preliminary session on Aug. 20 but the next session won't be until Sept. 23. At this point only a few additional dates in October and November have been scheduled, she said. AC Transit officials will present their plan at a workshop in the boardroom on the second floor of the bus agency's headquarters at 3 p.m. on Wednesday. The public will be able to comment on the plan after the presentation. The plan isn't on the agenda for the board's special meeting at 6 p.m. on Wednesday, but the public can address it during the public comment section of the meeting.